Property Details: 2 Bedroom, 2 Bathroom Property with approx. 900 square feet. 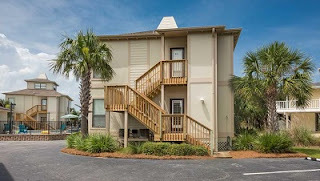 Perdido Key condo for sale at Molokai Villas. Rare opportunity to enjoy "Old Florida" in this adorable 2BR with boating and beach access! This very rare “villa-style” condo is open & airy with a “relaxed” feel that invites you sit back and enjoy the island lifestyle. Tastefully remodeled with beautiful kitchen cabinetry, modern appliances, tile flooring in living area and comfortable furnishings. Bedrooms are spacious and have loads of natural light coming through large windows or french doors. Bring your boat to the first come, first served docks, relax in the brand new pool, or walk across the street and enjoy uncrowded sugar white sands and gulf waters. Molokai villas owners and guests enjoy a lovely new outdoor pool with spacious sun deck, community boat slips on the deep waters of ole river, assigned parking and convenient beach access across the street. Truly the best of both worlds! Fabulous rental potential or second home!